What is that visage of Burger Heaven you see above? 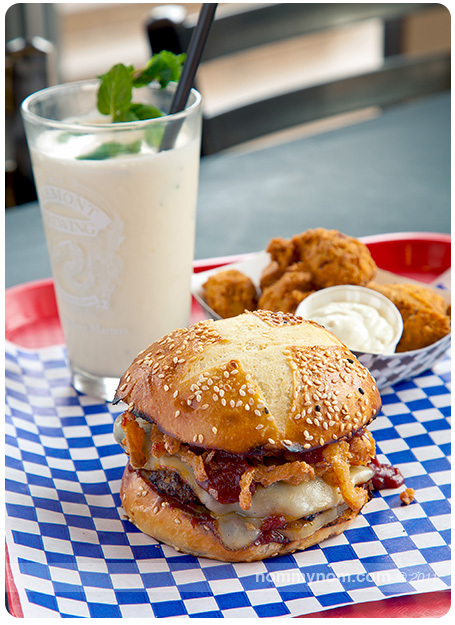 It is the ***Kelly Cline’s Secret Squirrel BBQ Burger. I can die a happy woman now that I have had the honor of having a burger named after me. Let me start out by saying that over the past year I have become friends with the folks at Blue Moon Burgers, it’s a fun place with fun people and they make a damn fine burger – and I’m a bit of a burger snob. In fact, over a few weeks I taunted them with my own recipe for a killer burger and brought in a jar of my Secret BBQ Sauce. Now this is a formula that I have been working on and tweaking since I was 20. We aren’t going to say the amount of decades that have passed since then, but let’s just say that I am pretty confident that I have perfected my formula for the perfect Sweet ‘n’ Smoky BBQ Sauce. Whenever I make my sauce, I make it 2 gallons at a time because I end up with my friends lined up with empty jars in hand ready for a refill. So back to the day I brought in the sauce… they took a taste of it and the look of doubt was wiped clean and they sat there with just a spoon and the jar and literally ate it right out of the jar. It was good. I was pleased. 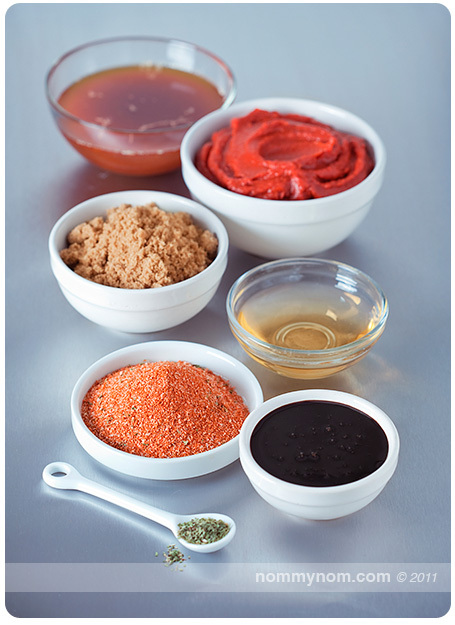 Now fast forward… every couple of weeks I would get an email asking for the sauce recipe, requests that I would deny over and over again. My sauce is special, it’s my baby… the recipe is Super Secret Squirrel! No one knows the recipe but me! Asking, turned to begging… and I gave in and gave them the recipe and they asked me to help create a burger to showcase the sauce. After months of back and forth and consulting and tasting (it’s a tough job, but someone had to do it!) 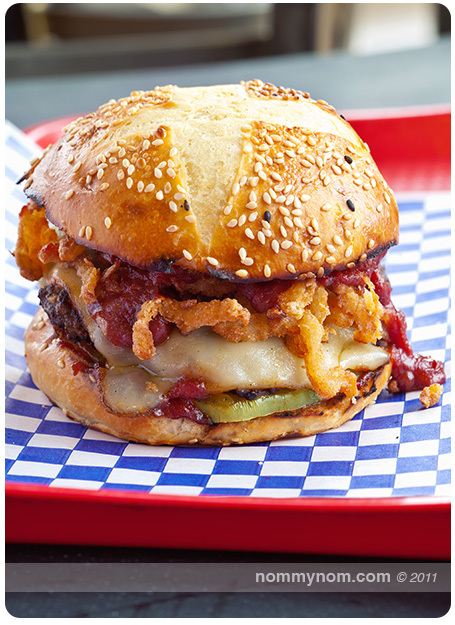 we came up with the Kelly Cline’s Secret Squirrel BBQ Burger. 5 ounces of grass fed organic beef patty dusted with my Secret Dry Rub on a grilled Macrina bun, housemade spicy pickles (I like having an extra one on my burger), crispy shoestring onions, melted Muenster Cheese all topped off with a smothering of my Super Secret BBQ Sauce. The folks at Blue Moon Burgers came up with a March classic Mint Shake (made with their house made syrup made with REAL mint) and some Old Bay Hush Puppies to saddle up next to that big beautiful burger that bears my name. YUMMY! So what the heck does all this burger talk this have to do with bloggers? Well… I’ll tell ya! Blue Moon Burgers will be hosting a “Meet the Puget Hound Bloggers” event at their Fremont Location where I will be hanging out with fellow Puget Hound bloggers. 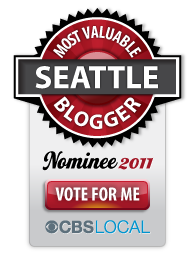 Puget Hound is a collection of local area blogs that cover everything from Sports, Crime, Food, Events, Music, Arts, local Travel, Dating and so much more. Come on down and meet some of the other talented bloggers like the man behind Another Passion and the mixologist behind ThirstQuest. This entry was posted in Events, Out & About, Restaurants and tagged barbeque burger, bbq burger, blue moon burgers, burger, event, food, kelly cline's secret squirrel burger, meet and greet, meetup. Bookmark the permalink. Oh my gosh, Kelly–such a huge tease! I don’t live close enough to get one of these babies, and you have no idea how much I want one right this minute. I guess I can try to make my own, but I know it wouldn’t even come close to yours. Phooey! Found your site via Blue Moon Burgers. The burger looks incredible and I can’t wait to try it. On a related note: I don’t suppose you have any plans to bottle your famous BBQ sauce for sale do you? If you did, and if it’s as good as the Blue Moon guys say, then I’d sure love to buy a bottle.